To Prepare the Fruit: Place the orange sections in a low ovenproof dish, sprinkle with sugar, and glaze under the broiler for 3 to 4 minutes. Divide the fruit between four ovenproof plates and place in a 200 degree oven. To Prepare the Orange Sauce: Squeeze the oranges to obtain 1 1/2 cups juice. Heat the sugar to a light caramel in a heavy saucepan over medium heat. Immediately add the vinegar and orange juice. Boil until the caramel is dissolved. Boil uncovered for five minutes reducing the volume by one-third. Add the Grand Marnier, swirl in the butter, and add salt and pepper. Heat the orange sauce and keep warm. To Prepare the Duck Breasts: Lightly salt and pepper the duck breasts. In a large skillet, heat the 2 tablespoons of butter and 1 tablespoon oil. When the butter begins to brown, add the breasts skin side down. Sauté for 3 minutes, then turn the breasts and cook an additional three minutes for medium rare. Increase the cooking time to suit individual taste. Remove from the pan and allow to rest for 5 minutes. To Serve: slice each breast into thin diagonal layers and place one breast on each of the warm garnished plates. 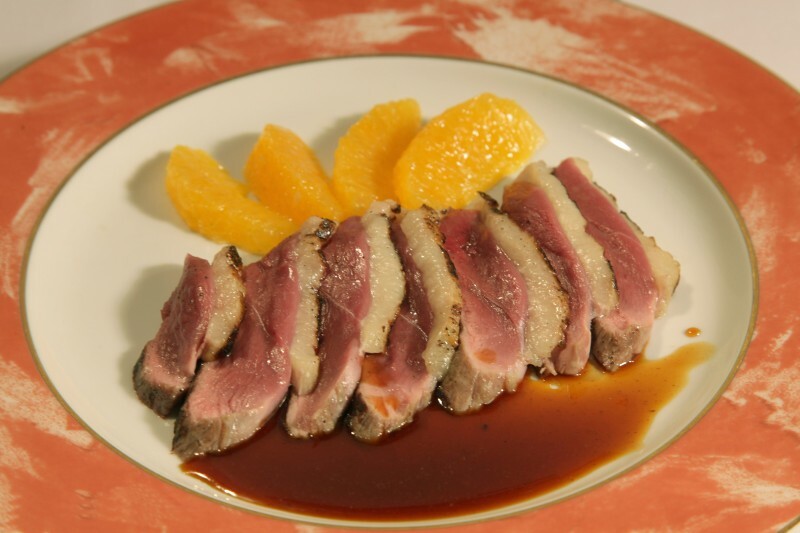 Pour the orange sauce around the breast slices and serve.